Walking around Brazil would have one slightly confused if this is a sports competition or one very big Halloween costume party thanks to the fans attending the 2014 FIFA World Cup. The country has turned into one big festival as people converge from all over the globe to support their national teams. Locals and foreigners alike pulled out all the stops and let out their creativity in donning their national colours and other out of this world costumes, some a bit crazier than others. Most commonly sighted are people who are wearing all variations of their national flag colours in their shirts, hats, wigs. face paint and any other possible prop that they can carry which could bear their country's name or colours. Clown wigs abound and shutter shades have come back into fashion as hundreds of fans walk around in country-specific coloured wigs and glasses. It also seems like everyone is already trying to get a feel of what it's like to lift cup as thousands of people are strutting around with replica World Cup Trophies in their hands. Bikini-clad women abound to the delight of spectators around the world and speaking of scantily-clad women, even Wonder Woman has been spotted enjoying the games. It seems like she has also invited some other superhero friends to watch the games including Hulk, who can be found both on the pitch playing for Brazil as well as in the bleachers sitting all green and scary. Batman, on the other hand, seems to be confused as to which team to support as he has been spotted in Italian and Mexican team colours. High-flying Superman Robin Van Persie seems to have definitely attracted other superheroes to show up. The King of Rock, Elvis Presley is alive and well and is also in attendance and it's only a matter of time before the King of Pop, Michael Jackson will be spotted among the crowds as well. 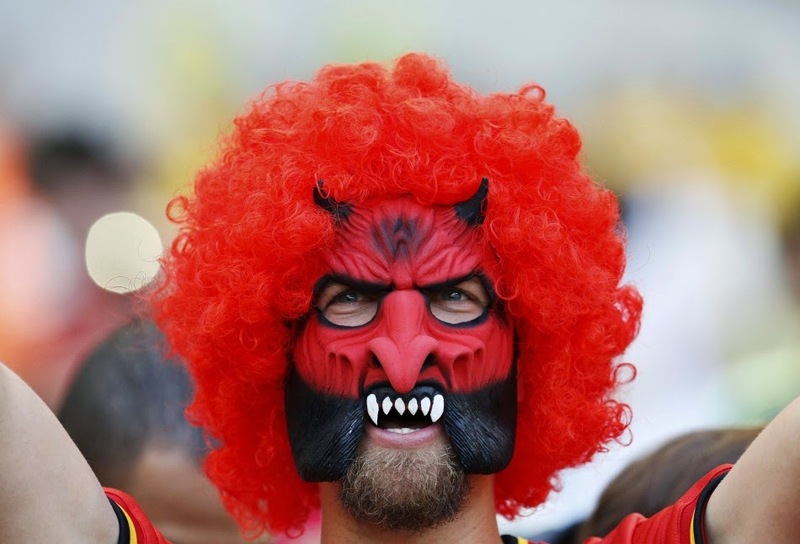 Aside from those rising from the dead, hundreds of little red devils made an appearance when Belgium played against Algeria. Mexican wrestling luchadors and mariachis were also spotted everywhere and there was the occasional reappearance of the banned South African horn, the vuvuzela. Santa is apparently a Russian and was spotted looking around for the naughty ones as he watched Russia's game against South Korea. The Italians are leaving nothing to chance and have gone to a higher power for help. They're now walking around wearing religious artifacts and pictures of Pope Francis. Perhaps they are hoping that some divine intervention will help them raise the cup again just like they did in 2006.